For those of you who might not know this story, skip on down to the bottom and enlighten yourselves. * For everyone else, let's stay up here and talk about the movie. All in all, the film is pretty neat if a tad long. Since Scott chooses to go very introspective and very modern with the personality of Moses, we see something much more realistic than Moses as he's portrayed in The Prince of Egypt or The Ten Commandments. At the risk of repeating everything that I said in that other post from September, I find this new trend in biblical movies pretty fascinating. For any person that went to church every Sunday as a child, it's interesting to see the stories you've heard 10,000+ times reimagined and made realistic. 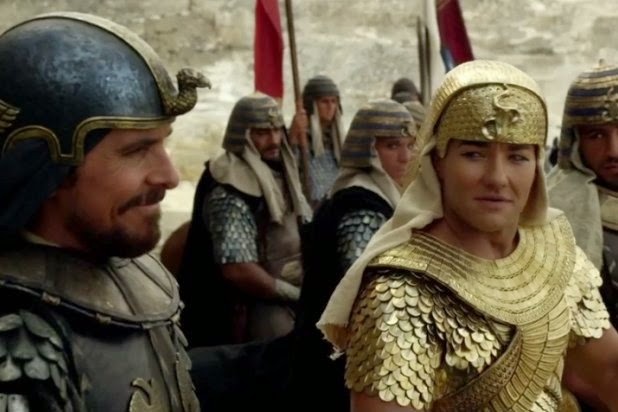 Such is definitely the case with Exodus: Gods and Kings, Ridley Scott's version of the famous Old Testament tale of plagues, miracles, and freedom. Much like Noah of last year, Exodus is an interesting watch in that it takes the biblical story and then builds on it and gives it depth. If you've ever read the story as it is written in the book of Exodus, things can be a little sparse on detail. You see the words on the page that Moses trusted God to do the right thing but a lot of times you forget how emotional Moses's ties were to Egypt. Seeing the film unfold is a great reminder that these weren't made-up characters, they were human beings with thoughts, feelings, and opinions. From his personalized sword, which was given to him by Ramses's father, to the fact that he was basically Ramses's right hand man for the first half of his life, them ties are deep and hard to cut. Another thing that I found interesting was the fact that in this movie Moses isn't always unflailingly accepting the things that God was asking him to do. He weighs possibilities and discusses things with him, and God even seems to ask his input on things. God seems a little more on our level than he does in the bible. Scott chooses to make Moses an atheist at the beginning of the movie which I also found interesting. Now, this is a little different than what I learned and a little different from what's in the bible. We don't really get a glimpse of what Moses's personality was like, nor do we learn from the actual book of Exodus what he was at the time of his banishment from Egypt (Prince of Egypt has him as the chief architect and Exodus portrays him as one of the pharoah's top generals of war), so there's a lot of wiggle room for creativity. But I found that kind of cool. When you're taught these lessons as a kid (and honestly, the way that Exodus is written reflects this as well) it's very God-is-omnipotent-so-we-do-what-he-says, but Exodus portrays this relationship as more two-sided than that, and by the end scene we see that not only do God and Moses respect one another -- they're kind of buds. I was a little bummed out by the fact that God is kept more mysterious in this version of the story -- and honestly if you're cynical enough you could make the argument that Moses suffers a massive concussion and that is why he goes through this whole ordeal to free the Hebrews. When you read it, God is with Moses almost constantly, telling him to turn his shepherd's staff into a snake, making the Egyptians uncomfortable, and all kinds of other direct God-to-Mo contact. Moses shouts at one point in the film "I'm tired of speaking to a messenger!!" but this is not so in the bible. We know that God originally appears as the burning bush but after that he pretty much is talking to Moses one-on-one. "Yo, Mo, lemme part that sea for ya right quick." The only qualm that I have with the movie is that I only wish Scott had chosen a bit more of a racially diverse cast, and that he should've added some more character development. In scenes where major Egyptian and Hebrew characters share the screen, there's no markable difference between them besides cleanliness. And honestly, characters range from being bizarrely super-white (Sigourney Weaver???) to wearing too much bronzer (yes, you, Ben Mendelsohn). 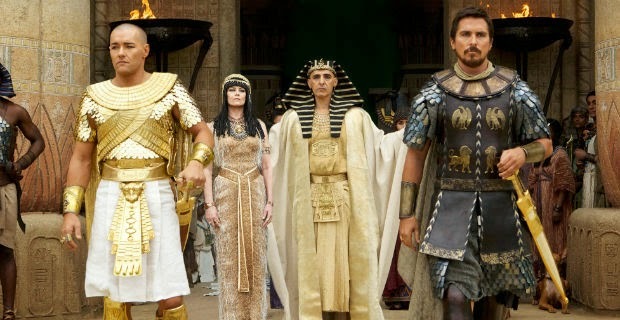 The only ethnic characters that we get to see are the wives of Moses and Ramses and, while they do a terrific job, they make the major casting even more obviously whitewashed. The accents, too, are a little weird. I think Americans have a tendency to be like "Well obviously we can't expect everyone to learn a foreign language so let's slap the audience with some British accents. That'll make it fancy." Weaver's heavy American accent is a bit of a jolt next to the clipped British tone of the film (I mean, come on, even Aaron Paul pulled it together and sounded okay). While the casting is a little weird, though, if we're being honest, Christian Bale has a hell of an audience draw and such a decision, while regrettable, is obvious in the eyes of stupid studio execs. Kind of a shame, but they do have to make a profit and it makes sense why they chose the stars the way they did. 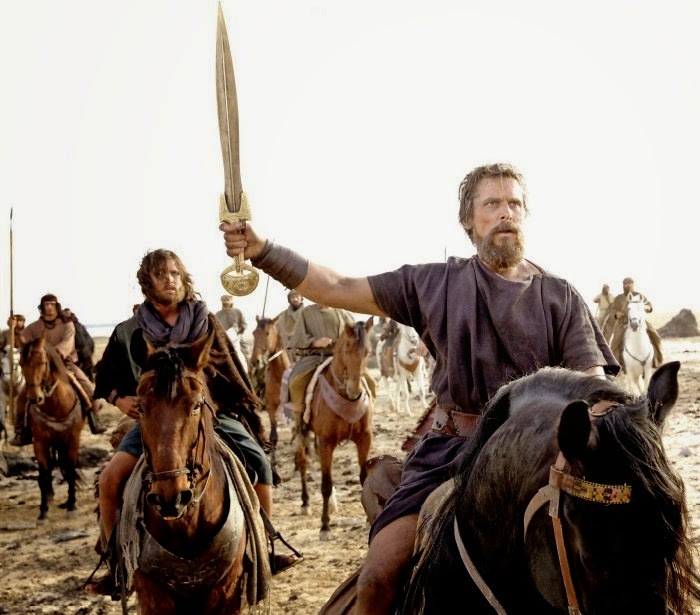 All in all, I enjoyed Exodus: Gods and Kings. If the whole bible thing doesn't appeal to you, go and see it for the special effects. Between the shots of ancient Egypt and the different plagues that we get to see realistically, it's pretty damn cool. 6 outa 10. Refreshing perspective, beautifully shot, contemplative movie; but a little long and would've been nice to see a more ethnic cast. *Moses was a Hebrew baby at the time the Hebrews were enslaved by the Egyptians. He was sent down the Nile in a basket by his mother to save him from being killed. The pharoah at the time had heard a prophecy that a Hebrew baby would be born that year and basically screw up everything that they had built. Ironically, the pharoah's servant/wife/somebody found Moses in his basket and they decided to raise him in the palace. When Moses grew up he fled Egypt after killing an Egyptian who was beating a slave. After hearing a message from a burning bush telling him that it was time to go set his people free, Moses set out for Egypt to bargain with the pharoah he grew up with as a kid. Long story short, the pharoah was not willing to free the Hebrew slaves. As a result of his stubbornness, God, working through Moses, hit the Egyptians with ten awful plagues. Livestock died, people grew boils and sores, there were unspeakable swarms of locusts and flies and frogs, there was hail the size of softballs, it rained fire, and (most horribly) God decided to kill the oldest child of every Egyptian family. (Fun fact: this is why Jews celebrate Passover, because God passed over the houses of the Hebrews and let their eldest children live. Hey, I told you he was terrifying...) After this, the pharoah finally let the Hebrews go. Then he changed his mind and tried to chase them and kill them all, but Moses parted the Red Sea and they got away, free to wander the desert for 40 years. But that's a whole other tale.